Struthiomimus sedens, the ostrich-mimic dinosaur (strouthion - ostrich, mimos - mimic) was a medium-sized (up to 15 feet long) ostrich-like theropod found in the Lance Formation and in other Upper Cretaceous deposits in North America. This creature appears to have been a fast runner that may have relied upon its speed to escape from other carnivorous dinosaurs that might have wanted to make a meal out of this tasty morsel. 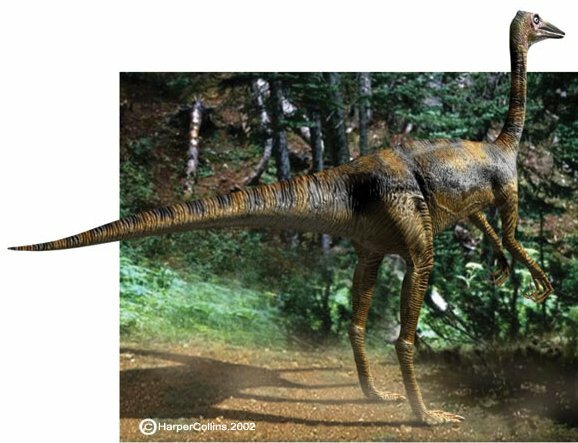 Except for its speed, Struthiomimus appears to have been unprotected. However, appearances can be deceptive. This specimen was equipped with formidable claws on its hands (left) and feet (right with phalanges) that certainly could have been turned to defensive use should the occasion require. Most theropods were carnivorous. Struthiomimus and other related taxa appear to be exceptions. The toothless beak (see image to right) would have been well suited for eating either insects or perhaps soft plant tissues or seeds and fruits. The genus is best known from a complete specimen on display at the Black Hills Institute in Hill City, South Dakota, not far from Mount Rushmore. This specimen, shown is spectacular in its completeness. 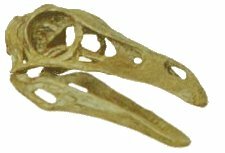 Since Struthiomimus has no teeth, and teeth are the most abundant and easiest means to recognize the presence of a specific dinosaur type, we have only a few phalanges from the foot that we can definitely attribute to this taxon in our collection.